This is the time of year that gardening really starts to drive me crazy. I spend so much time taking care of and babying my plants and they just seem to be growing so s-l-o-w-l-y! Thankfully there are herbs growing in that garden and many herbs are ready to harvest before the veggies come in! English Lavender (Lavandula angustifolia) is one of the first herbs I harvest each year. The pretty purple flowers make a lovely addition to many lotions, salves, sachets, aromatherapy items and even teas. Lavender can also be added to many dishes and most people don't realize that it is edible. I love to use lavender for it's aromatherapy properties. It's known to help induce sleep, calm anxiety, reduce stress and soothe headaches. I keep some lavender flowers in a sachet in my pillowcase to help me fall asleep at night. It's also included in my sleep tea recipe. Some of us are more sensitive to aromatherapy and it knocks me right out! According to Time Magazine the scent of lavender can even make people trust you more. Both the flowers and leaves have that beautiful scent, but if you plan on using them in cooking make sure your lavender has not been sprayed with pesticides. Lavender can be brewed into a tea which is great for digestive issues like nausea. Fresh lavender leaves can be used in pork or lamb dishes instead of rosemary. Lavender can also be used for many different skin ailments. 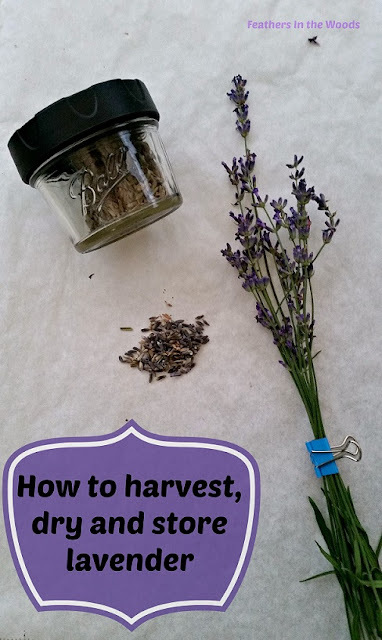 Lavender is very simple to harvest and dry you just have to keep a few things in mind. Always harvest your lavender on a dry day after the morning dew has burned off. Harvest lavender before the florets are fully open. Use a sharp knife to cut the stalks. Cut about 2" above where the woody part ends and turns green. Cutting too low can injure the plant. I like to spread out my lavender and let it dry overnight before bundling and hanging it. This gives any little insects I miss a chance to run for their lives (and out of mine!) Plus I can inspect them and pull out any old or damaged flowers. After the first night I bundle the lavender stalks together according to size. I like to wrap a rubber band around the stems and add a clamp to hang it from. Simply hang upside down to dry. Hang in a well ventilated area out of direct sunlight. It should take about a week to dry using this method. They will feel slightly crunchy when dried. You can also use a dehydrator or a lukewarm oven. I would recommend using an oven only if you can set yours to 100 degrees F. My oven doesn't go this low so I prefer to hang them. Once dry, use your fingers to slide the flowers off the stems the store in a jar. I use Ball Herb Jars for mine, but that's because I just love the shaker top! If you have a lot of lavender you can get Ball herb lids for large sized ball jars. After the flowers are done I then do the same thing, sliding my fingers up the stems to remove the leaves and store these also but in a different jar. The leaves have the same scent as the flowers and I use them in many of the same ways. I leave the jar lids open for a few days just in case there is any moisture left in them, then close and store in a cool dry place out of sunlight. Here's a post on How To Store Dried Herbs if you want more information on storage. I keep the dried stems to throw on the campfire for an amazing smell, it seems to keep the mosquitoes at bay too. You can also use larger dried lavender stems as kabob skewers if you want to add a subtle taste of lavender to your dinner! Or just throw them on the coals when grilling chicken or fish for a light smokey lavender flavor. If you like the flavor, there's lost of ways to cook with lavender. Lavender is difficult to start from seed, but once established it will produce ample lavender blossoms for years! For more information on growing lavender: How to Grow Lavender. There are so many wonderful things to make with my dried lavender, I just don't know what to make first! Interesting post especially for those of us who do not have a garden or herb to harvest . . . but always secretly wanted to! Thank you for sharing with us at Brag About It! I have lavender growing in the garden right now. I don't think I've ever passed it by without touching it to enjoy its fragrance. Amazing! Thanks for the great information! I found your site via A Delightsome Life, and I am glad that I did. I have had lavender growing in my yard for a few years, but this year is the first time that my pink lavender bloomed and I can't wait to try this technique with it. Thanks for sharing. I came over on the Freedom Fridays link up today, and I'm glad to find your site. I am impressed with your green thumb and your gardening skills. My grandmother could grow anything. Her roses were legendary. I'm not as proficient in the garden, but I really appreciate the talents and skills of others. Thanks for sharing this informative post about harvesting lavender. I have a friend I'm going to pass it too. This is such a well written post! Thanks for giving us this awesome tutorial! Thanks for joining the Link-It To Me link party, I hope you will party with us again next week! Oh how I wish I could grow Lavender...it doesn't do well in Florida though. I'll live vicariously through posts like yours though ;) This was terrific info. Thanks for sharing at the Homestead Blog Hop! I love Lavender and love harvesting it! I did not realize that cutting too low can damage the plant. Thanks for the tips! And thanks for sharing with SYC. 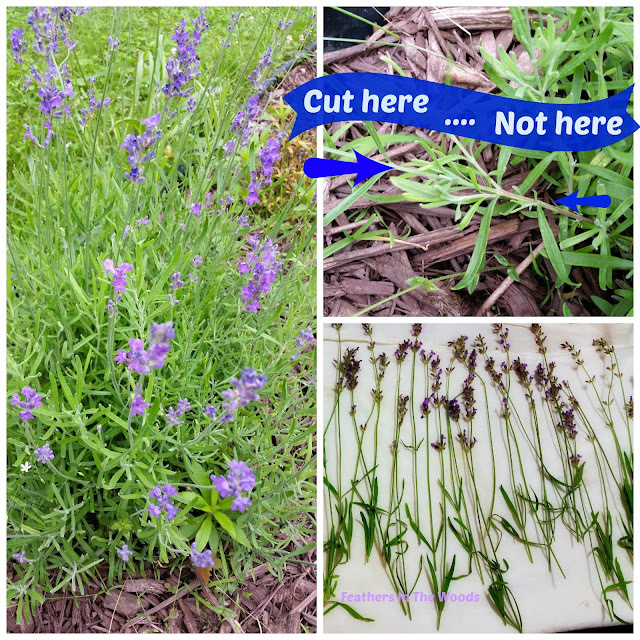 I love lavender and it fills a special role in my life so thank you for sharing how to harvest and dry lavender with us at the Healthy Happy Green and Natural Party Blog Hop. I'm pinning and sharing.